Hitwise have just published a list of the top hot christmas gadgets based on search term analysis, which provides “great insight into people’s habits and desires”. However when the iPhone fails to make the top 10 mobile phones you have to question the methodology. 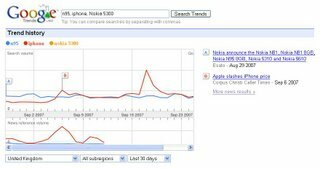 the top 2,000 search terms that sent traffic to a Hitwise Custom Category consisting of the top 100 online retail websites in the UK during the four weeks ending 22nd September 2007. Rather than listing the gadgets that people are after, it may be that the list shows those gadgets that: people are after AND online retail websites dominate the search results. 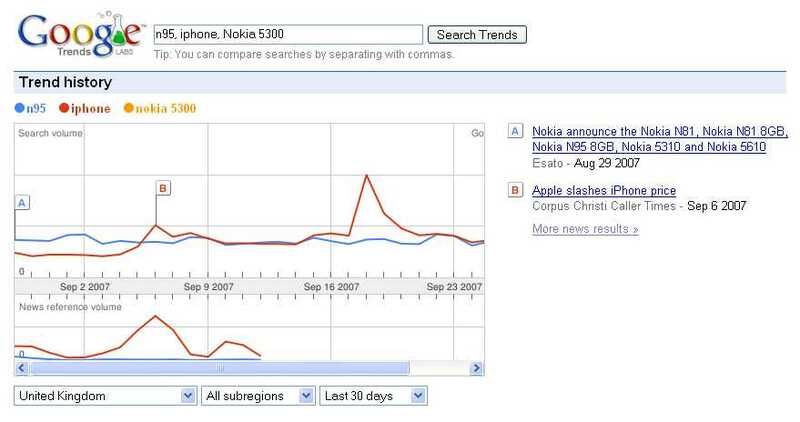 Hitwise’s excuse that: “The new iPod Touch and the UK release of the iPhone were announced too late to have a significant impact on the retail search data”, doesn’t seem to hold much water, as we can see from Google Trends that searches for the iPhone in the UK are up with the N95, whilst the Nokia 5300 doesn’t even register. There is a lot of interesting data held in the logs of web servers, but it is important that we don’t get carried away with how much we read into them.